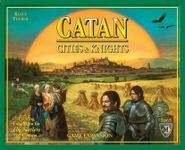 This is an Ultimate Trade for the second expansion to the ever popular Settlers of Catan. This is in great condition, the pieces have been punched and the stickers have been stuck, but the box has a bit of bowing, however it is certainly and easily usable. The retail price is about $40. This is the Mayfair Games 4th Edition of the game. See above for condition of the game.